The best family movies from 2006-2010 brought us tons of awesome animated features. From the heartwarming adventure story of an elderly man and a young boy to the action-packed comedy of talking transportation, it was definitely a good half-decade to be a kid! If you’re looking for a little flash-back family fun, check out some of our picks for the best family movies from 2006-2010! Related: 9 Family Movies from 2011-2015 That You’ll Want to Watch! 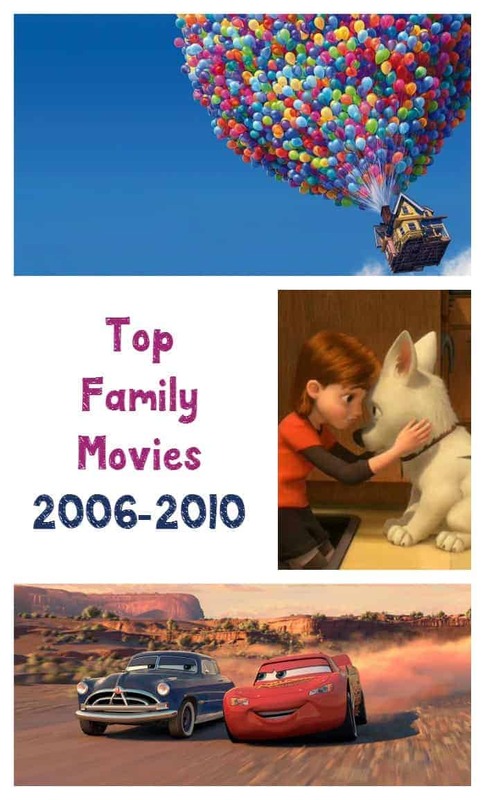 Did you watch any of these best family movies from 2006-2010 when they came out? Which are your favorites? Up is a 2009 3D computer animated comedy adventure film that features the voices of Edward Asner, Christopher Plummer, Jordan Nagai and Bob Peterson. Carl is an elderly man who works as a balloon salesman and lost his wife Ellie. When they were younger, Carl promised Ellie that one day they would travel to South America. When Carl is forced to go live at a retirement home, he decides to fly away, with his house in tow, by tying thousands of balloons to his home. As he heads to South America, he finds he is not alone in this journey. Russell, a young boy trying to earn his badge for assisting the elderly, is a stowaway in Carl’s home. Together, the two travel on a journey, meeting some interesting characters along the way. Cars is a 2006 computer animated comedy adventure sports movie that showcases the voices of Owen Wilson, Paul Newman, Bonnie Hunt, Larry the Cable Guy, Tony Shalhoub, Cheech Marin, George Carlin, Richard Petty and Michael Keaton. Lightning McQueen is a hotshot race car who only cares about winning. He is on his way to California to participate in the Piston Cup Championship. However, along the way he unexpectedly ends up in the quiet town of Radiator Springs. While there, he meets some characters of the town that show him that life is not all about fame, trophies and winning. Bolt is a 2008 computer animated road comedy adventure film that features the voices of John Travolta, Susie Essman, Miley Cyrus, Malcolm McDowell, Diedrich Bader, Mark Walton, Nick Swardson and Greg Germann. Bolt is a super dog, who experiences intrigue, adventure as well as danger every day of his life, once the cameras stop rolling anyways. He has always believed that he has superhero powers but learns that he doesn’t when he is mistakenly shipped clear across country. Along his journey to get back home, he finds two companions to travel with him and learns that to be a real hero you don’t need superhero powers. If you’re not really up for animated features, check out a few of our favorite live-action family movies from this time! Oh how I love Up. That movie breaks my heart a thousand times every time I watch it! I haven’t seen all of Bolt before, but what I did see looked like a really cute movie. I also think Nanny McPhee is another winner…I’ve actually seen that a couple of times. Such a great list of family favorites. I love these movies because everyone in our family can sit down and enjoy them together. I’ve seen all of these. Love Up! I Love LOVE up! I have a keychain with his house and balloons on it. My favorite! Awww we love Bolt!! Was such a sweet movie. I love your list–can’t wait to watch these movies with my nieces and nephews. Thanks for sharing this list! Great movies! Since we’re about to have our first baby I’m getting excited about when she gets older and introducing her to all the great family movies! Love all of these. We have a teenager now and still watch animated movies. SO many great movies. We love movies in our house and are constantly watching them. Especially older ones, my kids aren’t too sure about they end up loving! Up is seriously one of my favorite movies!! I always cry at the beginning because it’s so sweet! Thanks for sharing! Yes UP is like Inside Out that sad yet life-affirming engagement with psychological issues such as growing older, fear of death or depression. It is a wonderful movie. Pixar always has some awesome movies! Car and Up are two of my favs. The part in Up where you see Carl & his wifes history. Tears every time. We watched all of those! I absolutely love Up!! Pixar can do no wrong haha!